As we close out the first month of 2019 we’re emerging from a cold snap but the window of fishing opportunity will be open for the rest of the week before we plunge back into arctic air starting on Sunday. We’ll see temperatures in the low to mid 40’s for the next several days with a very manageable south southwest wind forecast in the 10-15 mph range. It looks even better on Saturday. No need to weigh watching the Super Bowl against fishing on Sunday…with highs in the teens and snow in the forecast the Super Bowl party is where you’re going to want to be. Prior to that however you should make every effort to get out and fish between now and then. We’ve currently got lodging available through the weekend but it will more than likely fill by the end of the day today. This would be the PERFECT opportunity to take advantage of our Winter Guide Trip and Lodging Special. $500 gets you a full day guided Missouri River float trip for one or two anglers and two nights of premium lodging at Wolf Creek Angler. We challenge you to find a better deal ANYWHERE. Don’t need the lodging? Full Day float trip is just $400. Don’t need the guide? Winter lodging is just $99/night (plus tax). Wolf Creek Angler offers the BEST WINTER FISHING DEALS on the MO’ Hands Down! Swinging, stripping and bobber fishing should all be good for the next several days and with a drastic weather change happening on Sunday fishing could be prime on Saturday on the edge of that system. It could also be a bust but there’s only one way to find out. You won’t know if you don’t go! Nymphers should target the SLOW, DEEP winter water. 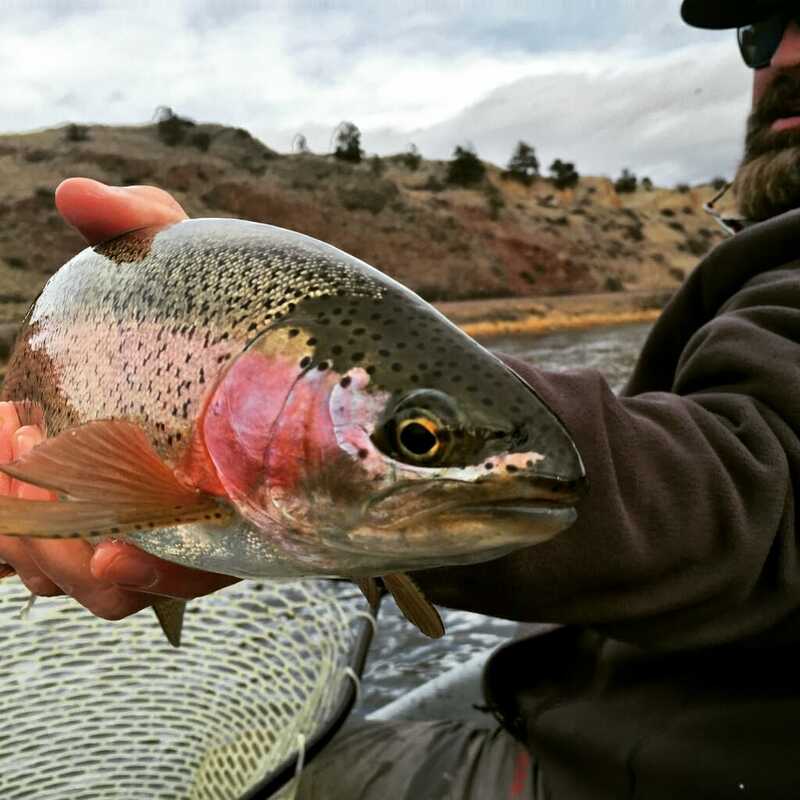 Pink anything, firebead anything, sowbugs, Zebra midges, Pill Poppers, Pederson’s Sow, Caviar Scud, soft hackle sows, UV Crush, Bubble Yums, Rainbow Czechs, Ray Charles….the usual suspects. Swingers and strippers you know what you like but best sellers have been Polar Leeches in Olive and Copper, Kreelex and Hot Head Kreelex in gold and brown or silver and gold. Mojo Minnows, Skiddish Smolt and Sparkle Minnows should also get the job done. Stop by for bugs and shuttles and while you’re here don’t forget to check out our best deals of the year on winter wear as well as blow out pricing on all of our Redington waders and boots. These deals are too good to pass up and won’t last long. Men’s and Women’s Sonic Pros and a few pair of Sonic Pro HD and HDZ’s left as well as women’s Willow waders and boots and a good assortment of Skagit and Prowler boots. Call ahead and we’d be happy to see if we have your size and hold it for you. We’ve also got Adipose boats for rent and if you happen to be in the market for a new (used) boat this season we’re selling our 2014 RO Deville as well as my 2013 Clackacraft Eddy. Give a call or message us on FB for more info or to make an offer. We are your pre Super Bowl Missouri River fly fishing destination!